Records and Milestones in 2019 — The Mongrel Punt Become a Patron! I’m a little torn. You see, I love seeing records broken, and the more records and numbers we have access to, the better. I’m in a bit of a conundrum – I’m a pseudo stat-head, yet I despise the current system that sees Champion Data hoard so much pertinent information about the game I love, and drip-feed it to the public via whatever publication pays for the right to access it. I know it’s not a bad business model – I just wish the AFL would bring their stats in-house, so we could all access them. Anyway, that was a bit of a quick unplanned rant, and given CD started recording many of the stats we quote today, maybe i should just shut up and enjoy what i do get for nothing, huh? Onto the topic at hand. We’re in a bit of a golden age if you love to see milestones and record-breaking performances. Tom Mitchell’s 2018 saw him record the most disposals in a season. His 848 touches beat the record set by Matt Crouch in 2017 by 23. Records fell - most hitouts in a season, most possessions in a game, most handballs in a game, and most contested possessions in a game all have new names next to them, but there are milestones and records we could see tumble in 2019. And if not 2019, then 2020 for certain. Let’s have a look at a few. And for the record, whenever I refer to Gary Ablett in this article, it is Junior except where total goals are concerned. Only three men have topped the 9000 disposal-mark. Rob Harvey, Brent Harvey and Kevin Bartlett. If he plays into 2020, Gary Ablett will join them. As it stands, Gaz sits on 8235 total possessions, 901 possessions in front of Scott Pendlebury, and if he has a similar year to his 2018 he could slot into fourth all-time by the end of the season. Rob Harvey’s 9656 possessions tops the list, and seems a fair way off at the moment. Assuming Scott Pendlebury has a similar year to 2018, he will tick over the 8000 disposal mark for his career in 2019. In addition to those listed above, others who have passed the 8000-disposal mark include Craig Bradley, Sam Mitchell, Michael Tuck, and Scott West. Pretty esteemed company. Gary Ablett is currently fourth all-time for handballs. He needs 225 this season to become the most prolific handballer in the history of the game. Last season, he had 256, so it’s a high probability that we will see Gaz with another accolade by the end of 2019. Pendles is a little further down the list, with 3693 to his name, and based on his 2018 numbers, a leap into third place by season’s end is not beyond him. Sydney’s Josh Kennedy is a further couple of hundred behind. Lance Franklin is 83 goals away from the magical 1000-goal mark. He’d need his second best all-time tally in 2019 to hit that mark, so a 2020 1000-goal celebration is probably more likely for Franklin. Buddy will join Lockett, Dunstall, Ablett Snr, Wade and Coventry and will certainly cement his standing as one of the greatest forwards of all time. He also currently sits fourth all-time on the behinds kicked table, with 659. Kevin Bartlett holds the record for most misses, with 781. Luke Hodge needs 444 kicks to become the 11th man to reach the 5000-kick milestone. The list is topped by Kevin Bartlett (8293 kicks… with only 858 handballs), but is also home to names such as Brad Johnson, Brent Harvey, Leigh Matthews and Nathan Buckley. Sadly, Hodge will most likely fall short, unless he can be convinced to play on in 2020 as he had only 248 in 2018. Heath Shaw is probably a better bet to make the 5000-kick club. He sits on 4480, but you’d think he has a couple of years left and he’d totalled 361 kicks in 2018 before his injury. Have a guess who has the most marks amongst active players? If I said he plays for Carlton? Didn’t see that one coming, huh? He has 1798 going into 2019. Heath Shaw is not far behind Simpson, with 1762 currently. Nick Riewoldt is the overall leader, with 2944 and looks like he’ll be in that spot for a long time. With Aaron Sandilands still getting around the field, he’ll add to his all-time record for hit outs. Sandi currently sits on 8325, with his nearest competition coming from fellow current player, Todd Goldstein, who has 6860. Sam Jacobs sits in fifth with 6439, but should go past legends Gary Dempsey (6479) and Dean Cox (6628) this season. Joel Selwood is the best placed player to make a run at most tackles ever recorded. He currently sits in sixth place overall, with Matt Priddis the number one tackler of all time. Priddis is on 1629 for his career, whilst Selwood is on 1438. In between them sit James Kelly, Andrew Swallow, Jude Bolton and Lenny Hayes On his current pace, it’ll take Selwood another two and a half years to catch Priddis. Surprisingly, Gary Ablett Jr, Scott Pendlebury and Shaun Burgoyne round out the top ten. It’s a tackling game these days, and even the best ball winners are required to put the defensive effort in. Heath Shaw sits second all-time to Dustin Fletcher in Rebounds. Fletch is sitting pretty on 1865, and Shaw has a fair bit of ground to make up, as he check in currently at 1500. Given Shaw had 146 in 2018, he’s two years away from catching Inspector Gadget, if he gets him. To indicate just how far these two are ahead of the field in this stat, Matthew Scarlett sits third on 1020. In terms of anyone who can challenge the Fletcher/Shaw duo going forward, Jake Lloyd (139) was second in the league behind Shaw (146). Currently on 383, he’d have to play another 13 years at that level to be in contention. Sydney’s Josh Kennedy trails only Sam Mitchell and Simon Black in total career clearances. He is on 1504 for his career and should hunt down Black (1715) in 2020 given he had 140 in 2018, but he’ll probably need to battle on to 2021 to get Mitchell (1804) you’d think. An inauspicious stat category will be owned by Buddy Franklin early in the 2019 season. 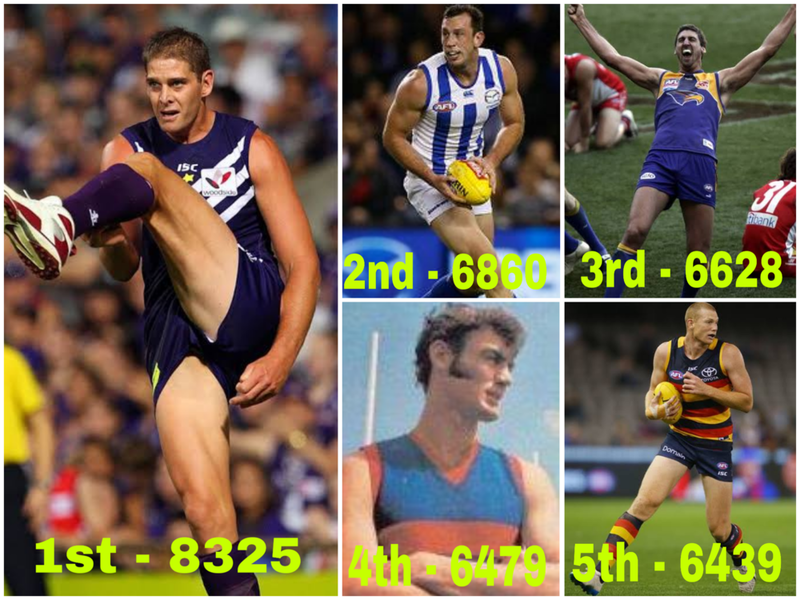 Buddy sits second in all-time clangers, just three behind former Crow, Scott Thompson. Thompson had 1071 clangers since the stat was introduced, but that record is about to fall to Franklin. Possibly even in Round One. Interestingly, three of Franklin’s former teammates sit with him in the top ten for clangers, with Luke Hodge third, Sam Mitchell fourth, and Jordan Lewis ninth. Much is made of Joel Selwood’s ability to extract free kicks. Currently, he is ranked 20th all time, with a fair bit of work to catch the leaders. Selwood has 732 career free kicks, but the leader is another former Geelong captain, Ian Nankervis, who must’ve had incriminating pics of a few of the umps. He is the only man to top 1000 free kicks in a career, with 1081. Contested possessions is a relatively modern stat, therefore you’d figure one of the hard men of footy would be ranked number one. Does it surprise you that Gary Ablett is the player with the most contested touches of all time, with 3722? Gaz is 199 ahead of fellow Brownlow medallist, Simon Black, with his nearest current competition coming from Sydney’s Josh Kennedy (3367) and current teammate Joel Selwood (3184). On 2018 numbers, Jordan Lewis could become just the fifth man to collect 5000 uncontested touches. He currently sits on 4660, and trails Brent Harvey (5743), Sam Mitchell (5334), Brendon Goddard (5205) and Kane Cornes (5068). Contested marking beasts? What a shame this stat wasn’t kept back in the 80s and 90s. It would’ve been great to see how legends stacked up. As it stands, Nick Riewoldt is number one, with 645 to his name. Next is Travis Cloke (521), Barry Hall (519), Matthew Richardson (506) and Jonathon Brown (490). But guess who comes next? That bloke who supposedly can’t take contested marks. Lance Franklin (469) should go past Brown, Richo, and challenge Hall this season, becoming just the fifth man to take 500 contested grabs in the process given he took 38 in 2018. And right behind Buddy is Tom Hawkins, who is on 452. With a good season, Hawkins could go close to catching Franklin. Franklin should also move into second place for marks inside 50 this season. The current leader, Nick Riewoldt again, sits on 1017, with Barry Hall in second with 936. Franklin is on 881, with Jack Riewoldt a further 100 behind. Rance currently sits in third, with 1550, and trails Gibson’s 1690, and Dustin Fletcher’s 1598. Rance had 217 in 2018 alone, so if he plays a full season, he should sit atop this category by September. Right behind him is Dale Morris, with 1545 – also a chance to ascend to the top of the rankings if he plays a full season. How about running bounces? Brent Harvey loved a good bounce. He had 1055 for his career. Second is Heath Shaw, sitting on 906. You’d think Harvey’s record could be safe, at least until Adam Saad gets a few more years in the bank. With 93 and 95 in the last two years, he’ll start coming into contention toward the latter half of his career. Eddie Betts already has the most goal assists in history, with 275, and looks safe for the time being, with fourth placed Gary Ablett Jr the closest active player. Gaz is on 229, with teammate Joel Selwood on 211. Tom Mitchell holds the record for most disposals in a season, with his 848 the best on record, but could Matt Crouch come back and take the title he held for all of one year? Crouch’s 2017 yielded 825 touches. They join Dane Swan (820) and Dan Hannebery (802) as the only player to exceed 800 disposals in a season. Clayton Oliver holds two of the top five seasons in terms of total handballs, including the best of all time in 2017. His 482 edged out Matt Crouch in the same year, but Oliver proved he was no one-hit wonder, with 472 last season as well. Max Gawn owns the most hitouts in a season, with 1119 last season, but with three current rucks as the only men to go over 1000 hitouts in a season, could Todd Goldstein (1058 in 2015) or Brodie Grundy (1038 last year) make a run at him? Paddy Dangerfield holds the record for most contested possessions in a season, with 430 in 2017. Next best… or the next three best is Josh Kennedy, with totals of 425, 423 and 410 – that is consistency! Clayton Oliver became just the third man to hit the 400-ccontested possessions mark in 2018, totalling 405. In terms of uncontested possessions, no one can touch Andrew Gaff. He owns the top two amounts of all time (554 in 2017, and 537 in 2015). He was on target for another big total before the Andrew Brayshaw incident last year as well. Jeremy McGovern is the only current player to have his name in the top 30 for contested marks in a season. His 67 last year were good enough for 15th all time, but a far cry from the 95 racked up by Travis Cloke in 2011. McGovern does hold three of the top four totals for intercept marks, however, including the all-time record, set in 2018. Goal assists is an interesting one. Jake Melksham led the league last season, with 33. It was good enough for third all time, but how good must have Jason Akermanis been in 2004, when he racked up 44 direct goal assists? Shane Edwards slotted in with 31 last season too, which gave him ninth overall. Hey look - a Mongrel Bumper Sticker! click the image, grab a sticker and help spread the Mongrel word. Little things like this make the site viable. The only current player to sit in the top 30 for kicks in a game is Heath Shaw. Heater racked up 36 kicks in a game against the Bulldogs in 2016. The all-time record is held by Bob Skilton, who had 44 kicks in a game back in 1967. That’s basically unbreakable. As mentioned above, Matt Crouch holds the single-game record for handballs, with 35 against the Kangaroos in 2018. He is closely followed by Tom Mitchell (34), Gary Ablett (33) and Mitchell again (32). Alex Jesaulenko’s record for most behinds was almost broken in 2007, when Buddy Franklin missed 11 times. Not good enough to topple Jezza, who kicked 12 behinds in 1969 against the Hawks. Todd Goldstein’s 80 hitouts in a game seems unassailable, but Max Gawn notched two 66-hitout performances in 2018. Maybe he could get him? Sam Jacobs has a 74-hitout game, and Aaron Sandilands has a 70, and 69-hitout game to his name. Tom Liberatore, Jack Ziebell and Jude Bolton have all registered 19 tackles in a game, which is phenomenal. Matt Priddis and Mitch Duncan have both notched 18, whilst Sam Powell-Pepper, Jack Steele, Stephen Coniglio, Andrew Swallow and five or six others all have topped 17. Josh Kelly, Patrick Dangerfield, Mark Ricciuto and Adam Simpson all hold a share of the record for inside 50s in a game, with 16 apiece. Kelly looks most likely to break this, given he completed his record-tying game in 2018. In terms of free kicks, Collingwood’s Billy Picken, Geelong’s Sam Newman and Fitzroy’s Warwick Irwin all had 13 each in an individual game. What the hell was happening to these blokes back then? Joel Selwood’s best in a game is seven for those playing at home. Most clearances in a game? Cripps, right? Josh Kennedy? Mitchell? Ablett? Nope – it’s Paul Salmon. The Big Fish is the only man to ever top 20 clearances in a match, with 22 against the Kangaroos in 1998. Of current players, Shaun Burgoyne and Gary Ablett have both registered 18. Three current players make up part of the foursome that hold the dubious honour of most clangers in a game. Heath Shaw, who is popping up everywhere in these lists, Sam Powell-Pepper and Nat Fyfe have all hacked it to join Adam McPhee with 13 clangers in a game. Former Pies captain and Port premiership coach, Mark Williams once had 13 free kicks paid against him in 1983. Right behind him is dual-sport star Max Walker, who had 12 against him. Ben Cunnington is the only man to ever top 30 contested touches in a game. He notched 32 of them in 2018 against Richmond, and both Patrick Dangerfield and Sydney’s Josh Kennedy have come close with 29 apiece. Most uncontested touches in a game? The kick behind the play specialist, Joel Bowden had 41 in 2009 and Leigh Montagna went close with 40 in 2013, Jake Lloyd and Seb Ross both notched 35 in 2018 games to be the highest ranked modern players. Scotty Cummings holds the record for most marks inside 50 in a game with 14 (to match his 14 goals) but Franklin had 13 in 2014, and Nick Riewoldt had 13 as well in 2006. The only current player outside Franklin to make the list is Jack Riewoldt, who took 12 (once in 2014, another in 2018). Harris Andrews has the record for most 1%ers in a game with 25 (including 23 spoils, from memory). Dougal Howard looks like the most likely to unseat him with 21 and 20 recorded in the past two seasons. Andrews also has a 20 to his name, so those two look like they may duel for this honour over the next little while. Nathan Bock once took 20 running bounces in a game… geez. Heath Shaw is the only current player in the mix here, with totals ranging from 16-19 that see him appear in the top 20 on four occasions. And old mate, Stevie J still reigns supreme as the number one assist man in an individual game, with 10 against the Dees in 2011. Three players have had seven assists (Trav Varcoe, Chris Judd and Jonathon Brown) which shows just how outstanding that game from Johnson was. So there we have it. Minutes… maybe an hour of painstaking research from the old Mongrel to compile all this. Got any to add? Got any hot tips for someone to come out of the box and surprise us? Let us know. Newer PostRoad to Redemption, or Last Lap 'Round the Block?